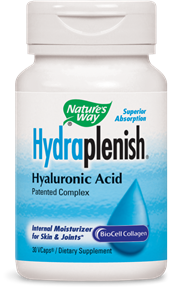 Hydraplenish™ has superior bioavailability and a lower molecular weight than other sources of hyaluronic acid. Hyaluronic acid is a "gelatin-like" fluid that acts as a natural lubricant and shock absorbent within the body. It's an important part of healthy connective tissue, and is also abundant in the eyes, joints, heart valves and skin.